AZITO is pleased to introduce new artworks by Hiroshi Fuji. Lots of happy rings in the air at 3331 Art Chiyoda. Tigers are making a circle and look like dancing. This is an artwork created by Hiroshi Fuji, combining each tiger brought from children through the project called “Kaekko (swap)”. 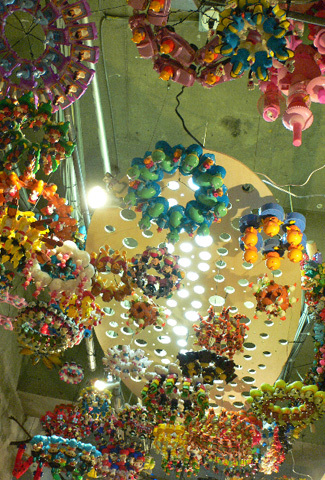 “Kaekko” is a project Fuji organized as a place where children could barter toys. Children even manage the “kaekko” shop, and kids who come to “kaekko” without toys can help out, gain points, and trade them for toys. And these tigers were brought from those children. 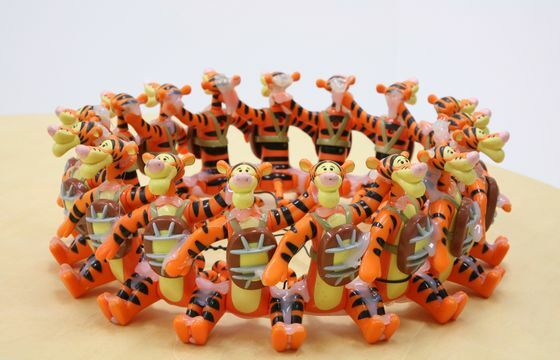 How could children have the same tigers? It is because they were Happy Meal toys that children acquired from McDonald’s. Fuji has his artistic concept as “ways of transforming existences (thoughts) that are not valued by society into special existences.” He used the tiger toys, which is not much valuable into an new eye catching object which will inspire the people. He used many of these Happy Ring artworks to create a large installation which makes you feel like in another world. As an artist, you can see how great drawing technique Fuji has in the artwork “IFH-GT”. This is a drawing of the giraffe tower which was exhibited for the exhibition “Project to make a fictitious character Fujishima Hachijuro” held at The Setouchi International Art Festival 2010. The Setouchi International Art Festival is a contemporary art festival that takes place on multiple islands of the Seto Inland Sea. It was first held in 2010 and it attracted a huge response from hundreds of thousands of visitors. 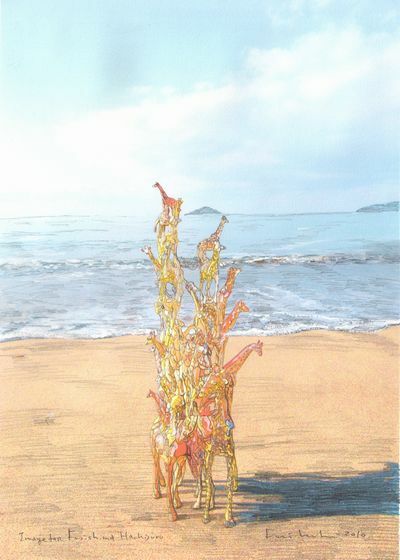 This giraffe was set at the sea side as it is shown in the drawing.